The Micro-Drill is a workhorse in a kit. This versatile powerhouse is ideal for milling, drilling, grinding, cutting and sanding circuit boards. It removes coating, cuts circuits, cuts leads, drills holes, cuts slots, shapes FR4 and performs many other procedures using various interchangeable bits. 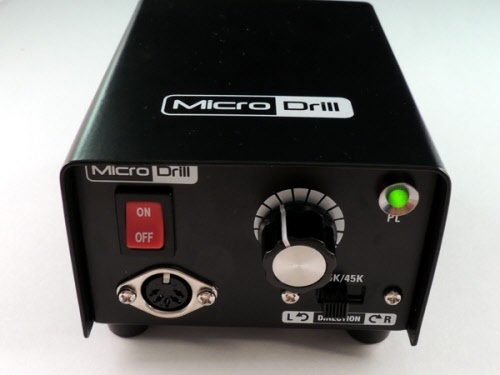 Unlike most hand-held tools, the Micro-Drill has a tiny, high speed DC motor in the hand piece, eliminating bothersome drive cables and giving the technician better control. A separate power supply keeps the hand piece lightweight and reduces fatigue. Power is supplied by a panel switch or foot switch for ease of use. ■ High quality construction for delicate work. ■ Flexible telephone-style cord eliminates bothersome drive cables. ■ Quick change chuck for easy bit replacement. ■ Versatile forward, reverse, and variable speeds. 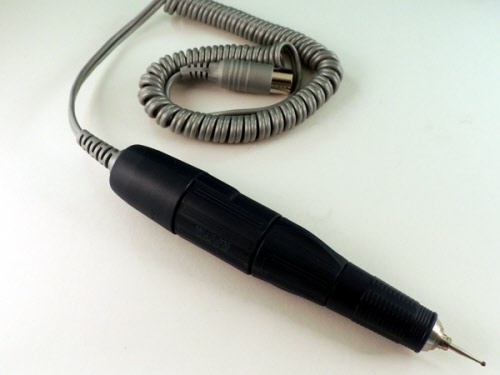 ■ Lightweight, ergonomically designed hand piece reduces fatigue. 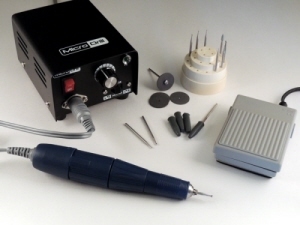 Includes a selection of tools and bits for use with the Micro-Drill System. 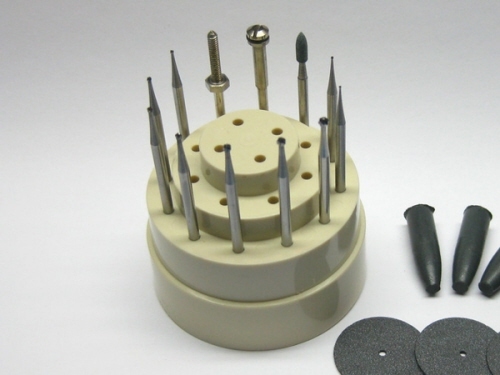 Includes Screw Mandrel, Threaded Mandrel, Abrading Tips, Cutoff Disks and Ball Mill Pack. Valued at over € 62.00 when sold separately.